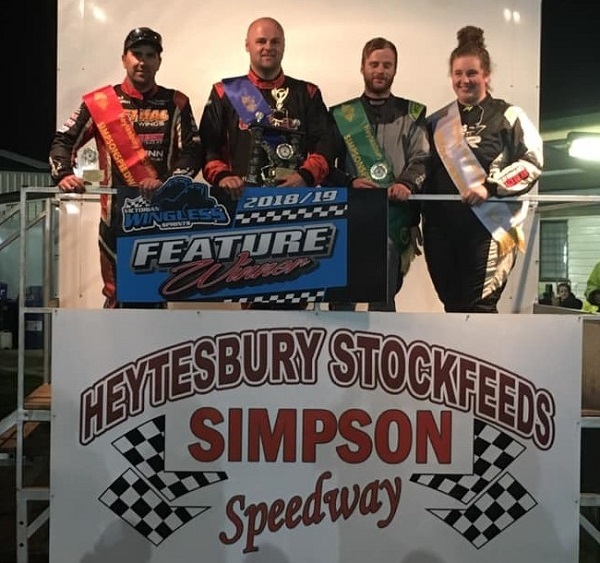 Making a cameo appearance last Saturday night at Simpson Speedway, 410 Sprintcar regular Sam Wren proved that he hasn’t forgotten what it takes to win aboard a Wingless Sprint, clinching top honours in the Peter Merrett Trophy Race. Despite his victory being a convincing one, it wasn’t as simple as holding his position at the drop of the green flag, with Wren lining up on the outside of the front row alongside Clint McLaren, who managed to earn the pole position start for the 25-lap feature race. Heading into turn one side by side, Wren asserted his nerve, as he held strong on the outside of McLaren, quickly forcing his rival to falter, which allowed Wren to power into the lead. From there, Wren was unstoppable, going on to claim the chequered flag over three seconds clear of his nearest challenger. There were numerous battles between McLaren and third-place starter Tim Van Ginneken, another 410 Sprintcar regular, throughout the distance, but in the end, it was Van Ginneken who came out on top to claim the runner-up spot, leaving McLaren to settle for third place. Doubling up on the night in both open competition and the opening Salt Electrical Ladies of the Dirt series round, Carly Walsh was in fine form, retaining her starting position by placing fourth, followed by Leigh Armistead in fifth. After starting from position 12, Alex Thomson did well to make his way up to sixth, while Michael McDonald, Robert Whiteside, Ashley Cook and Aron Lawrence rounded out the top 10. Another Salt Electrical Ladies of the Dirt Series competitor in Jess Moulden was the best of the rest, with Matt Bartlett, Mathew O’Shannassy and Geoff Cook completing the field. The race’s first casualty came just two laps in when Matthew Balcombe retired to the infield, later being joined by South Australian driver Mitchell Broome, Shaun Lyness and Chris Halesworth. 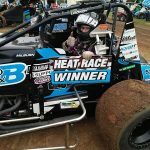 During the night’s eight heat races, no drivers managed to double up, with wins going the way of Van Ginneken, currently Australian Champion Alex Ross, McLaren, Balcombe, Wren, Whiteside, Sean Fitzpatrick and Walsh. It was certainly a night to forget for Ross, who experienced a massive rollover during his second heat, which saw his car flip several times before landing heavily upside down on the track. Ross was transferred to hospital where he has since been cleared of any broken bones, but will be in recovery for other associated injuries. Best wishes to Ross and his family. Earning herself a transfer spot into the feature race, Moulden emerged victorious in B main one, with Cook also picking up a transfer spot, while B main two saw Lawrence claim the win ahead of O’Shannassy. 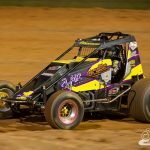 The next appearance for the Victorian Wingless Sprints will be a doubleheader on April 19 and 20, which will include nights one and two of the Garry Bowden Cup at Rosedale and Bairnsdale Speedways, with night one also incorporating round two of the Salt Electrical Ladies of the Dirt Series.